The Doon Girls School is an exclusive residential primary school in Dehradun, the capital of Uttarakhand and home to some of India’s finest school. It is our mission to prepare young girls for the best secondary schools in a nurturing and happy environment. It is an environment in which our students not only achieve excellence in academics, sports and co-curricular activities but also grow as individuals. We believe in strong Indian traditions as is reflected in our activities and in our emphasis on moral and human values, courteousness and respect for others. The school was founded in 2000 to address the need for a best high- quality preparatory school for girls. It is situated on a secluded, tree lined 2 acre campus in the exclusive residential colony of Dalanwala next door to Welham Girls’ School’s former junior section. The property has been tastefully designed to suits the need and requirements of the little ones. Dehradun, at a height of 700 meters, is picturesquely situated with the mighty Himalaya to the north, the Shivalik and Rajaji National Park to the south, the Ganga to the east and the Yamuna to the west. It is 250 km north of New Delhi and easily accessible by road, rail and air. 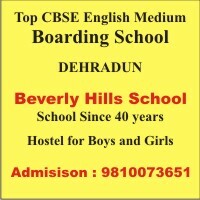 Children from North India and overseas come to be educated in the city’s justly famous boarding school.